2nd of August, 9.30am – 7.00pm the Open Design City will host a one-day workshop to build 3 to 5 cargo-bikes out of old bicyles and shopping carts ( 210 liters). What´s so nice about it: instead of welding we will work with clamps and clips. Besides the the purpose of construction we want to test the feasibility of the How-to and explore improvements. The results will be documented on our project-wiki. 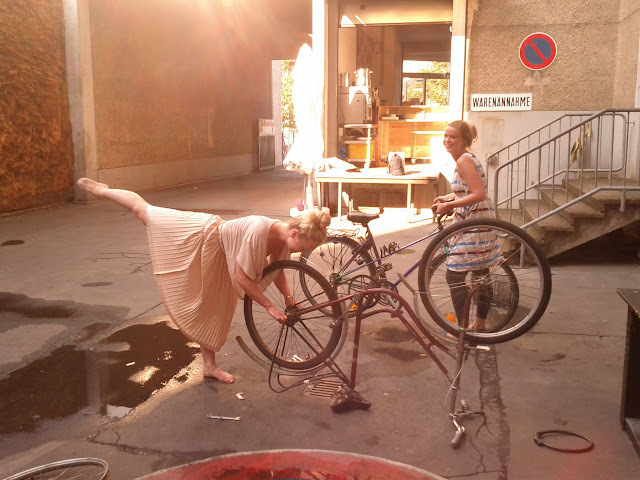 In the evening we will have our regular monthly workshop-cargo-bike meeting and present the results of the day. Everbody is invited to come and get involved. Bring your old bikes, Shopping carts, because we have on a limited amount of old-bikes and carts… clamps, connectors, tools and storage are provided. For 3-5 projects the foundation Stiftungsgemeinschaft anstiftung & ertomis will cover the costs, if the constructed bike will be lend to others. Energy Street Fighter: Jetzt geht Loss! also am 02. August um 19.00h in der ODC. Wir werden die Ergebnisse des experimentellen Frachtrad-Workshops des Tages vorstellen! We are proposing to meet every two weeks. To share ideas, projects that we are doing or papers that we are interested on. Open Design Now; Why Design Cannot Remain Exclusive will be launched internationally during DMY International Design Festival Berlin, on the 2nd of June. 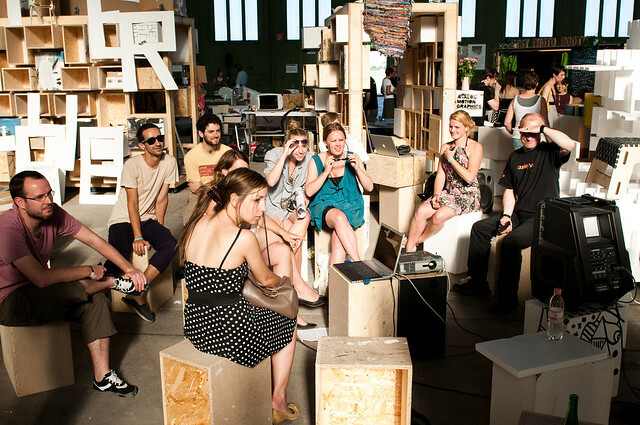 You can join the book launch of Open Design Now at Berlin’s new creative hub, Planet Modulor. Of course drinks and music will be open source too! Open Design Now is the result of a collaboration between Creative Commons Netherlands, Premsela, the Netherlands Institute for Design and Fashion, and Waag Society, Institute for Art, Science & Technology. Order Open Design Now for only € 24,95 (including shipping in The Netherlands) before 1 July 2011: www.bispublishers.nl/opendesignnow/aanbieding. Of course the book will be for sale at the book launch too. Every 4th Monday of each month Mesh Up Monday - the regular meeting for all kinds of needle work at Open Design City. Come along to work on your knitting or sewing project, or get to learn knitting, sewing or other related techniques! Two sewing machines, some material, (knitting)needles and yarn are available for trying out stuff. You are also welcome to bring your own materials even if you don’t know how to use them yet! PS: The electronics-hacking meeting “baustelmontag” is running parallel at the same time and place – so if you are woking on a textile+electronics project (e.g. wearable electronics) MeshUpMonday is the place to be for you! Bau­s­teln ist für alle da. Die Grund­la­gen dazu gibt es in unse­ren Work­shops, die in der Regel in Ber­lin an unse­rem Stand­ort, der Open Design City (Prin­zes­sin­nen­straße 19–20, U8 Moritz­platz) statt­fin­den. Gerne kom­men wir aber auch dort­hin, wo Work­shops benö­tigt werden. Auch anderswo geben Leute Work­shops: Ein­fach mal unter Ter­mine nach­schauen, was in dei­ner Nähe ange­bo­ten wird. Dein Ter­min steht noch nicht drin? Sagt uns Bescheid! (Kon­takt­info bei Ter­mine). In der Open Design City spielt nicht nur bau­s­teln mit: Was noch so an Work­shops bei uns in Ber­lin ansteht, steht auf der ODC-Website. Auch wenn kein Work­shop ansteht, kannst du vor­bei­kom­men: Am bes­ten jeden Mon­tag Abend ab 19 Uhr, da ist Bau­stel­mon­tag in der Open Design City. Das heißt: Gemein­sam oder alleine an Pro­jek­ten arbei­ten, andere Baust­ler ken­nen­ler­nen und Work­shop­kennt­nisse prak­tisch umsetzen.